Also known as "Le rêve du huard"
"Loon Dreaming opens with loons gracefully riding the waves. Then suddenly we see the world through the eyes of one of these spectacular birds. We dive down deep into the waters in pursuit of fish, launch skyward from the water and fly high over the busy highways and sprawling subdivisions that scar the natural world--before gently splashing down on a secluded lake. The artistry of Iriz Pääbo and her creative use of digital technology are a magical mix! 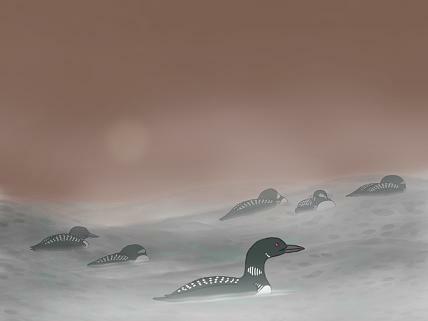 A forest transforms into an explosion of colour, the passion of loons becomes palpable, and their hunting call resonates. A film without words." National Film Board of Canada. "NFB -- Loon Dreaming/Le rêve du huard." National Film Board of Canada. http://onf-nfb.gc.ca/en/our-collection/?idfilm=51000.